This is a project based in data of the “World Justice Project Rule Of Law Index, 2016″ by the SCMP infographics team. Our goal was to show the information in a simply visual interactive tool, to give our readers also a perspective of Hong Kong and the world overview. This was a very fast-build graphic, the idea was to show the world rank moving up and down from the last year to this year and also a visual report of each country/region. Country report assets. The graphic is generated by json data thought js, this svg assets are rotated, scaled and positioned according the country data. This graphic is a combination of css, svg, js, and json data. But only uses 8 files of a simply vector shape, so load very fast. The main idea was to give a comparison tool, to view the countries of interest side-by-side but also their position related to other countries in the region, that is the irregular shape, according to the scale, the average of each of the 7 regions is added via js to every country. The graphics evolved to an more effective visual representation, in my work is usual to create at less five previous concepts, from data reports like excel pivot tables to paper concepts and finally to vector graphics. The most effective way to show the data, some times come on the fifth or seventh iteration, but is the best way to create some informative and usable infographic. A few months ago I start this project about the tallest statues in the world. My intention was to show in someway the tallest structures without the noise and distortion of pictures. I love photos, but for this things is really hard to get a full picture of structures from different countries in the same conditions, so the solution was to make drawings of more than hundred statues around the world. The Gutenberg project has a collection of tall statues from all over the world, that was my first source, but a corroboration of each of the 125 statues founded was just the begging. High resolution images of reference, hours of google earth to get a location in a interactive pop up map, data of completion, theme, date of build start… When all those data facts was corroborated 98 statues was the result of two months of investigation (not at full time of course). Every country section has a sort information about the statues located there, but also is popup launcher for an interactive map. I start the drawings in Illustrator, on the maximum canvas size to be sure to capture many details as posible, then I move to photoshop in layered document for each group of statues by country, day and day of drawings almost make me crazy but at the end I trust the result will be nice. 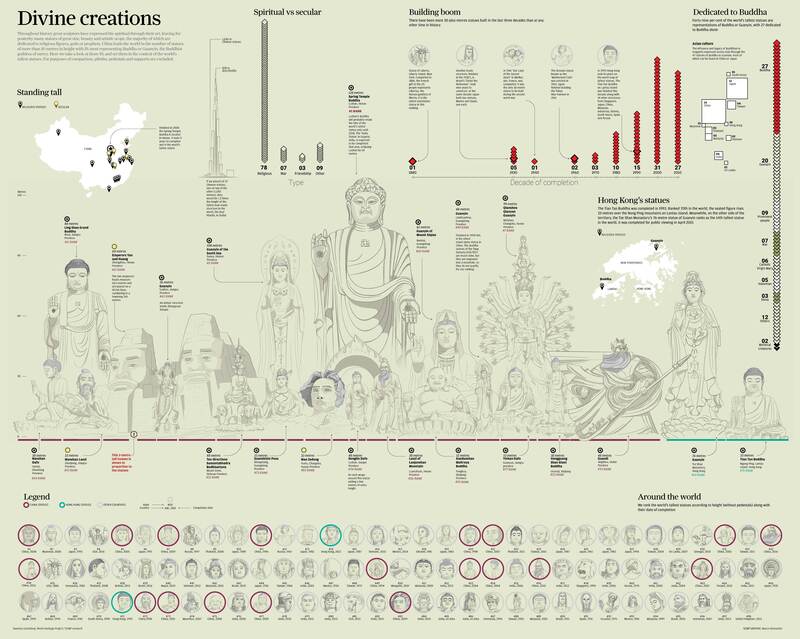 Even on a spread page on the SCMP the print version will never be enough to fit all the 98statues with all this data, this project born on digital but also was required a print version, so I take China -the top country builder- and the local Hong Kong statues, some facts around the graphic are only in the print version because the idea was to make it complementary rather than same graphic in different platform. This project shows the statues grouped by country, from the top quantity country to a group of only one statue per country, but also has interactive maps and a little things like the rank in the bottom, you can click each and the page will scroll to the statue position.